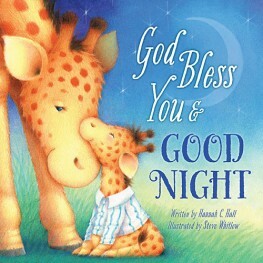 This darling board book is an excellent night time read. Geared for ages 1-4, you won't be able to tell my 5 year old that it is too young for him. He firstly loves giraffes so when I saw this cover I knew he would love it. He does and actually has me read it to him every night! Surprisingly it is the page that talks about a goodnight hug that is his favorite. Such love in these beautiful animal mommies and their babies, that youngsters will related to their love for their own mom. The routine that the animals go through before bed is much like the child. Mav has bookmarks throughout the book and carries it with him during the day. That is one of the most precious things to me! He knows it is special because he truly understands how special it is to have a Mommy. He has always been a mommy's boy and this book is super special to him! I think it will be super special to your little ones too! Enter to win a copy of this book for you little ones! We don't have any little ones so no routine to report. Would like to win for my friend's little one! For my grandkids, we read a couple stories and have cuddle time. I love to lay in bed with my son when we say prayers. We review the day and say prayers for everyone in our day. I always sing a nursery rhyme. I just make up the melody! My little ones went through a bad dream period so now one thing I do every night is sit with them and talk about what they are going to dream about. They love it. My children are all grown but my daughter reads to her three every night right before bedtime...they won't go to sleep without a story!